It’s often the case that roulette and blackjack dominate the table game scene, not only in the standard versions, but also in the live casino offerings as well. 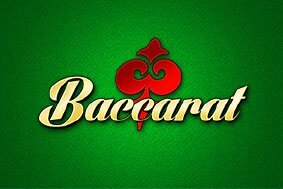 However, one game that has found itself increasing in popularity over recent times has been Baccarat. This is quite possibly due to its simplicity of play, but even in the ease of playing such a game, you’re able to enjoy the entertainment side of it. There are actually three popular variants of the game available to play, which are punto banco, also known as North American Baccarat, baccarat chemin de fer, also known as chemmy, and baccarat banque, also entitled à deux tableaux. The game itself is basically a card comparison game played between two hands – that of the dealer and that of you, the player. Each round has three possible different outcomes of ‘Player’, ‘Banker’ and ‘Tie’. The game itself first showed up in 19th century France, although it was preceded by products with similar game play, such as Macao and Oicho-Kabu. In the game, cares are provided with point values. Any of them from two to nine are worth their face value, while 10s, Jacks, Queens and Kings all have zero points value. Aces are worth a single point, and Jokers are not used. While it’s true that the value of the cards is laid out as mentioned above, the actual value of the cards are worked out according to the rightmost digit of the sum. So, if you’re dealt an eight and a seven, which together totals 15, the value of both will be five, as this is the rightmost number in 15. This being the case, the highest possible hand value in any game of baccarat is nine. Taking a seat at a baccarat table will provide you with three separate boxes for placing your wagers in. These will state, ‘Tie’, ‘Banker’ and ‘Player’, and you’re basically gambling upon which one of these will end up being the owner of the higher valued cards. You can, of course, place bets on more than one of these if you so choose. Once you’ve placed any bets, the dealer will deal two cards to both yourself, the player, and two cards to themselves as well. If neither the play nor the dealer is dealt a total of eight or nine in the first two cards a tableau of drawing rules is consulted, first for the player. If the player has an initial total of between zero and five, he or she is dealt a third card. If the initial total is of six or seven, he or she stands. In terms of the banker, if the player has stood, he regards only his own hand and acts according to the same rules as the player. If the player has been dealt a third card, the dealer has to act according to a few more complex rules. This all depends upon the value of the cards currently in the player’s hand, and this affects the outcome of the third card drawn by the dealer. It can get a little confusing here, but fortunately for you, the live casino version of the game is only something that the banker needs to be fully informed on, and they will act according to this tableau. As mentioned, there are three possible outcomes of a hand of baccarat. Either the player wins. The dealer wins. Or there’s a tie. If you’ve gambled on the incorrect outcome, you’ll lose all of your wager. However, if you’ve placed a wager on a correct outcome, you’ll be paid out accordingly. If you’ve placed a bet on a tie being the outcome of the game, you’ll receive a pay out of nine for one. If, on the other hand, your winning gamble was on the banker or player having the winning hand, you’ll be rewarded usually with a pay out of two for one. Why Should This be Played in a Live Casino Setting? As in all live dealer games, your personal preference will dictate whether or not you decide to continue playing a product. We enjoy live baccarat because of the authentic casino aura you find yourself in. There’s a live banker, meaning that you can be sure of fair played games, thanks to being able to see the cards being dealt and shuffled. Not only that, but you have the chance to chat and play amongst many other gamers at the same time, meaning that you might not feel so alone in your gaming endeavours. On the whole, standard baccarat games present you with a nice table game, but in our minds, the live version is a little bit more enticing.